At 11AM today there is a larger than expected Golden Gate Eddy which you can see in the satellite animation below. Note the finger of fog enhanced by the eddy has Pt. Isabel sensor reading 20. Also note the Año Nuevo clearing looks atypical so I am a bit worried about Waddell. No need to post. There has been an eddy everyday for the last 6 weeks. I appreciate and want Mike to post. Often he is providing additional information with screen shots that help me forecast what is going to happen at Natural Bridges. Yep! Fog! For the West Bay folks July and August is Treasure Island (if you can beat the traffic) or Coyote. Crissy is too spotty, most of the time overcast or dead in the fog. Even Candlestick does not work too well. I have been sailing 3 times a week average at Coyote for two months 4.3/5.0 and the occasional 5.8, always powered up especially in the channel ... but I do miss Treasure Island a lot! Fog is God! PI was off the chart for great sailing days last month, 20-24 days depending on how beat you were! Everyday we would show up shaking our heads in disbelief. This month has again picked up after a few smokie days killed the wind last week. I can't remember a year where PI had all the wind and Berkeley almost none. Some odd changes in the wind direction going on for sure this season. Keep the fog a rollin. WNDZFR; I can't remember a year where PI had all the wind and Berkeley almost none. Some odd changes in the wind direction going on for sure this season. If you look carefully at the satellite animation above you can see why Pt. Isabel has had great winds and Berkeley only weak winds. A Golden Gate Eddy you see in the imagery gives the wind coming through the Point Blunt - Treasure Island SLOT a more SW curve than it would otherwise have. This favors Pt. Isabel over Berkeley. Without the eddy the wind going through the slot goes more westward before curving towards Pt. Isabel or may barely curve at all which favors Berkeley. The reason for this is that the wind coming through the SLOT from the Golden Gate is "feeling" two different pressure gradients. 1. The pressure gradient towards Sacramento favors Pt. Isabel slightly while..
2. the pressure gradient towards Altamont Pass to the CV slightly favors Berkeley. Since the air coming through the Golden Gate to Slot zone is usually chilly stable air it has a hard time climbing the East Bay hills and mostly takes a combo of lower elevation routes to Sherman or through the Altamont Pass area. Every day the interplay of the 2 pressure gradient pathways impacts the relative strength of Pt. Isabel vs. Berkeley winds. This makes forecasting predawn very tricky for those sites. On some days the relative impact of these two pressure gradients is almost perfectly balanced and you see the Berkeley T in the satellite image. Berkeley rages on those days. 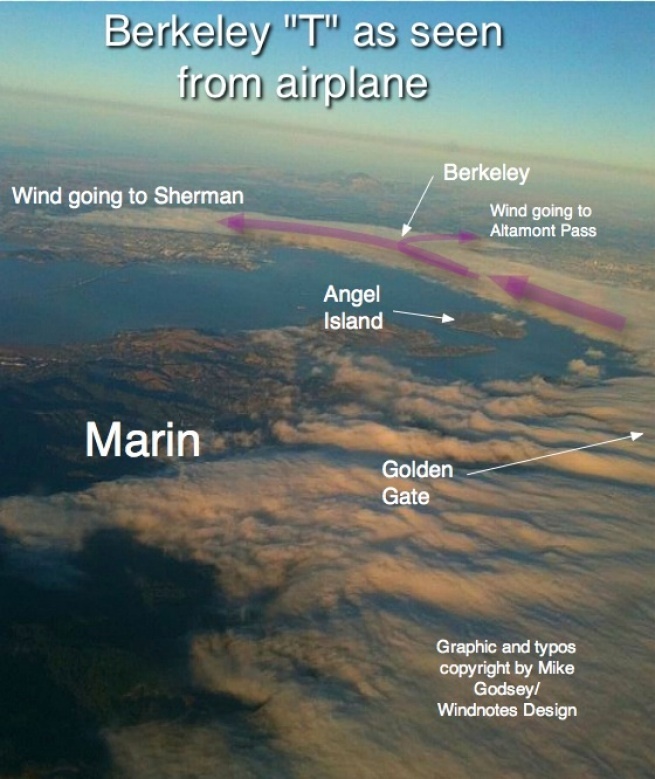 The photo below shows the Berkeley T.
Same fog that can makes TI roaring ... kills Crissy and the wind line happily moves straight on the Island .... If only traffic was not impassable!!!!! !